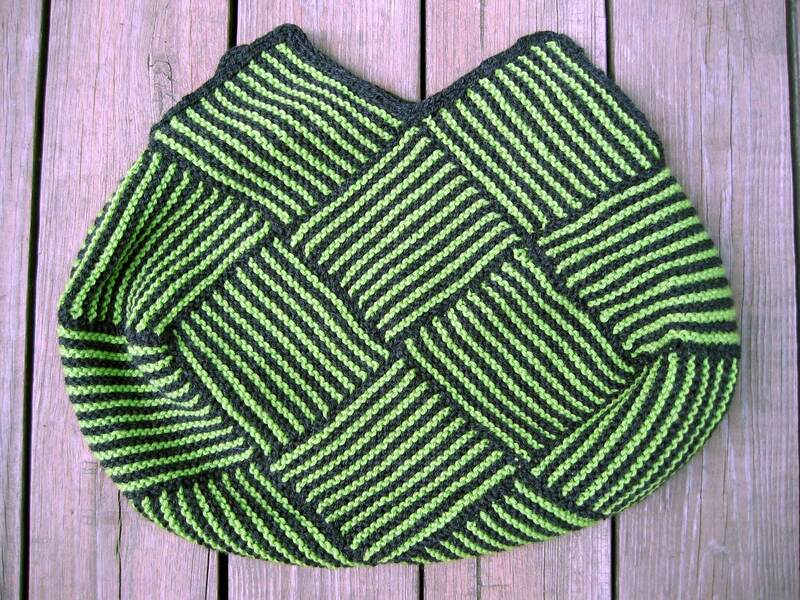 A year ago I took my first knitting class and started my first felted project: the Garter Stitch Bag. 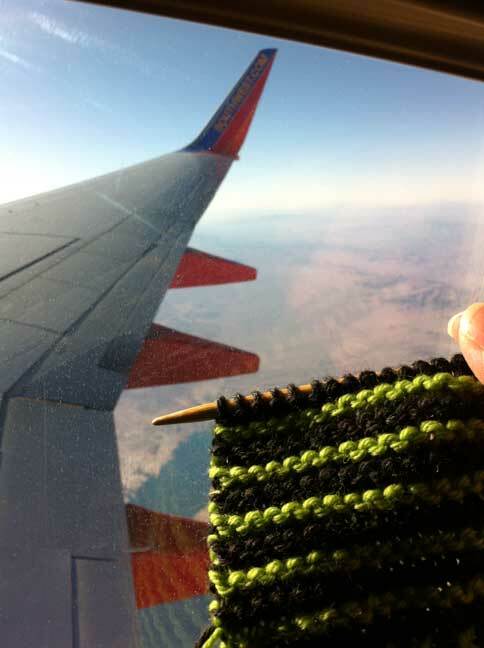 I finished the bag in time to take on a business trip to Vegas at the end of October 2011. On the plane I started the same bag for my sister. Her bag was going to be larger than mine but not as large as the original. For my sister’s bag I cast on 21 stitches and made the squares 42 rows. 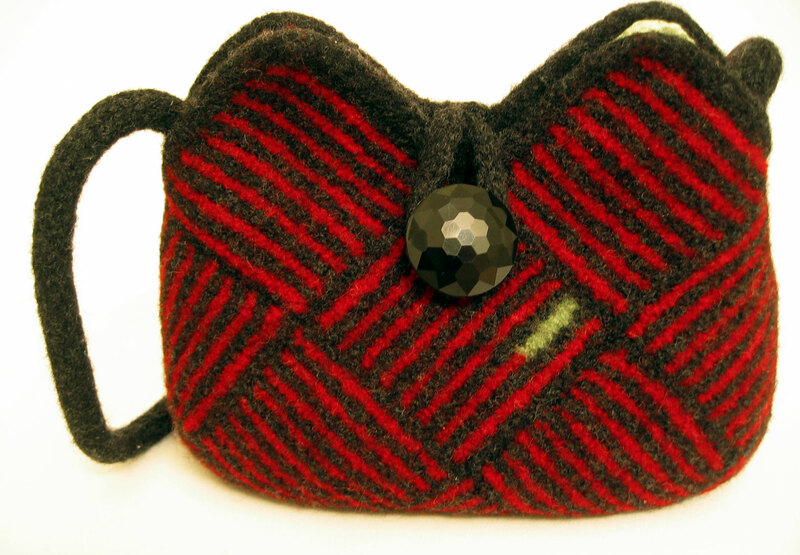 Click here for my Ravelry notes for those interested in my bag. I worked on her bag when ever I felt like it. I had no deadline so I could work at my leisure. It got bigger and bigger and once summer and the hot temperatures arrived, I couldn’t work on it too much. A wool blanket + 90 degree temperatures = an unhappy and unproductive knitter. Once the thing was assembled, there was still the i-cord border. 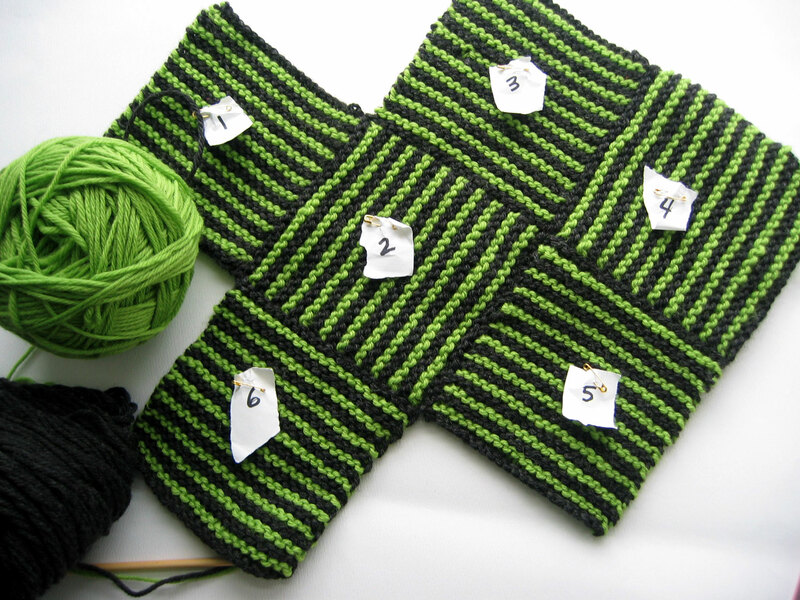 I had forgotten how to do an attached i-cord border but managed to find some great instructions on the purl bee blog site. The before felting measurements were 22 inches across and 36 inches from front tip to back tip. Each square was 5 1/2 inches square. The post felting measurements were 18 inches across and 29 inches from front tip to back tip. 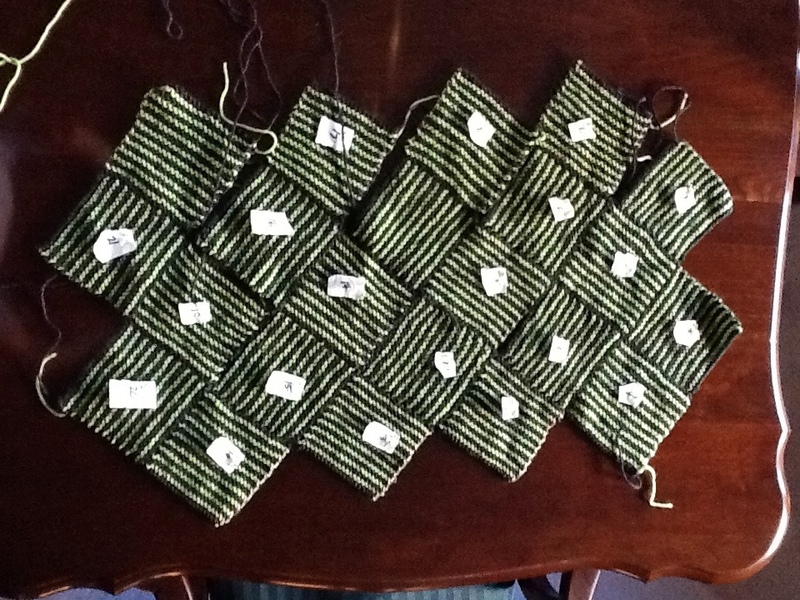 Each square was 4 inches after felting. (I think.) I could have felted it more and made it smaller but that was the perfect size for my sister. 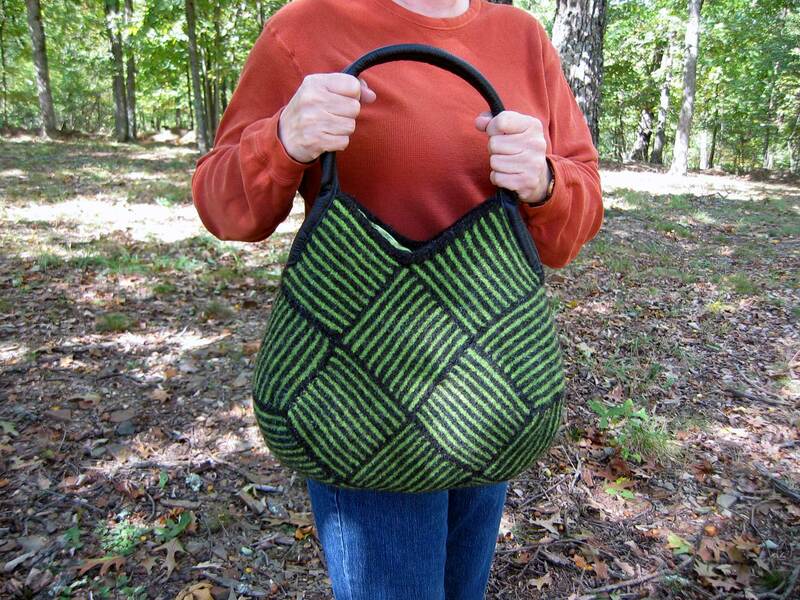 I have a few suggestions for those who have made this bag and want to line it. Fill the bag with towels, yarn, whatever you have. This will give you a more sturdy surface and 3-D form to work with. I pinned the lining fabric, right side to the right side of the bag then used a fabric marker to outline the shape. I made sure to mark which side was which as my bag was not perfectly symmetrical. Trim the fabric leaving plenty of room for the seams, at least one inch. Sew on any pocket(s) before sewing the sides and darts. 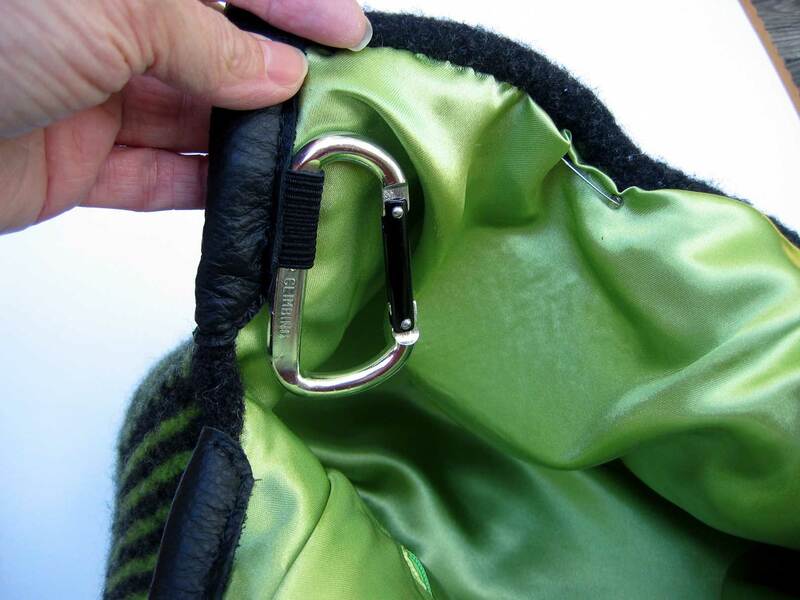 Trim any bulk and put it in your bag, lining up the top and sides. Pin the whole thing inside the bag. Fold the top edges under about an inch and hand-stitch in place. I did have to notch the lining around the “valley point” at the center. The last thing was to sew on the leather straps. My sister wants to put in a magnetic snap so I left the tops section of the lining open. She’ll have to finish that part herself. 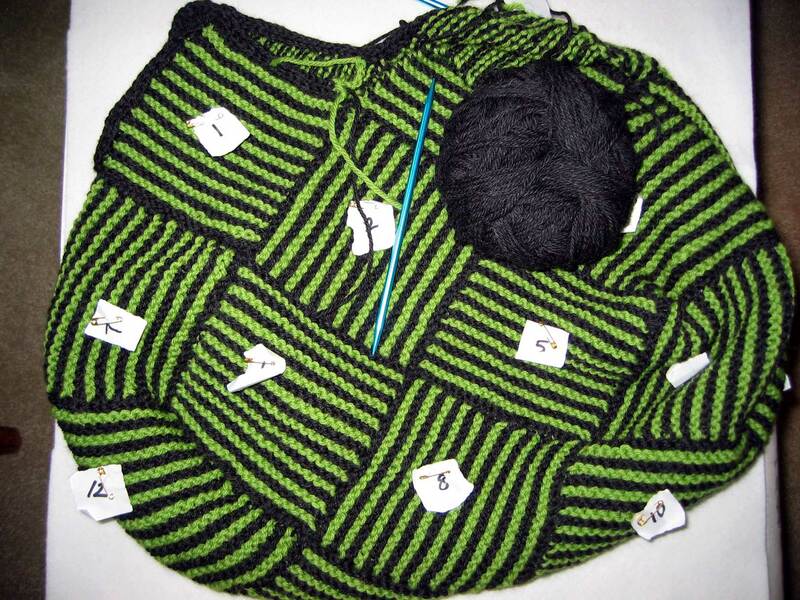 Cascade 220 in Primavera (green) and Jet (charcoal heather). Size 8 US needles. Leather straps. 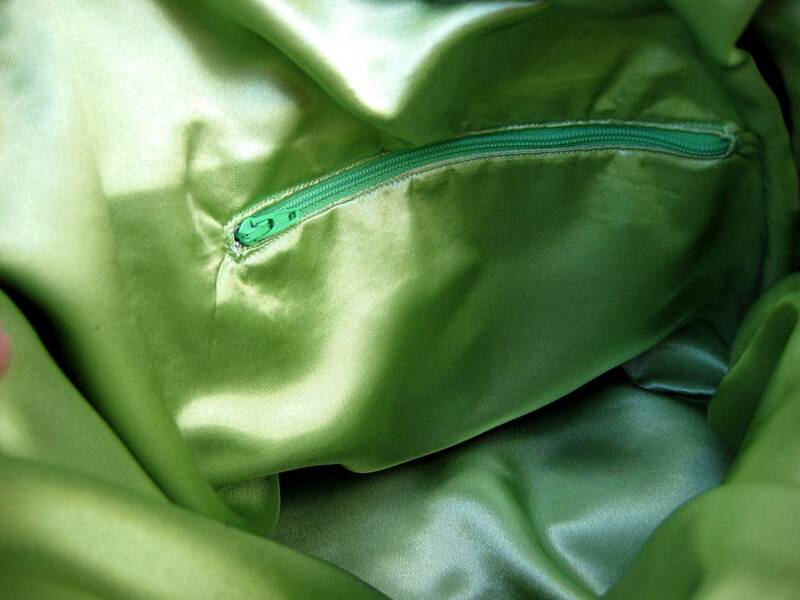 Satin-type lining, matching thread, 1 1/2 inch piece of elastic, and a 7″ zipper. The finished product, inside and out. I added a piece of elastic inside and slipped a carabiner in it to attach keys. I also used iron on interfacing where I thought her magnetic snap would go. This entry was posted in finished object, knitting and tagged felting, finished object, knitting by Patti_is_knittinginflashes. Bookmark the permalink. The leather straps already had little holes punched through so it wasn’t hard at all. I used a sewing needle designed for leather and regular thread held double. What can I say……This is by far the most beautiful bag I have ever received……and I LOVE it. Do I have the snap sewn on yet……NO!. It is an awesome piece of art though! Going to see Ebby this weekend and showing it to her. Thank you is not enough but THANK YOU! It is such a beautiful bag! I have loved watching your progress/process in making it! Thank you! 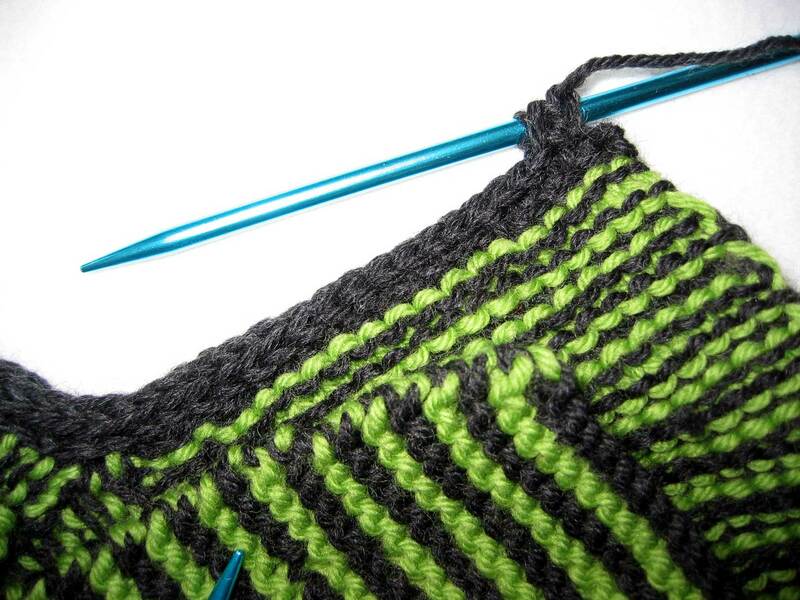 I used Cascade 220 which is a light worsted weight. I don’t really remember how much it took as I used partial skeins but I know I used less than 440 yards of each color.